The “Weaving Resistances” project, from the Organization “Democracy and Global Transformation Program” in Peru, shares three videos that are testimony to a constant and courageous struggle of, especially, women from the provinces of Celendin, Bambamarca and Cajamarca in Peru’s northern highlands. These lands have seen a resistance of over three years to the mega mining project “Conga”, from the Peruvian company Yanacocha, associated with Compañía de Minas Buenaventura, the US company Newmont Mining Corporation and the International Finance Corporation (IFC) of the World Bank. 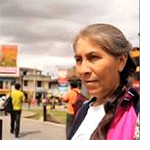 The testimonies expose the key role of women in the processes of social mobilization in defense of the territories and rights against the mining industry and in front of a government allied to the transnationals that insists on criminalizing and assaulting the guardians of the lakes and territories.